i. Superintendent of Prisons (SP) Medical, CONMESS 02. Applicants must be holders of M.B.B.S; M.D; M.D.S; or equivalents from recognized universities. ii. Superintendent of Prisons (SP) Vetinary CONMESS 02. Applicants must be holders of D.V.M from recognized universities. iii. Deputy Superintendent of Prisons (DSP) Pharmacy, CONHESS 09. Applicants must possess Bachelor’s of Pharmacy degrees from recognized universities. Applicants must be holders of first degree from recognized Universities in the following areas: Humanities, Social Sciences, Psychology, Estate/Town Planning, Public Health, Food Sciences, Social Works, etc. i. Senior Inspector of Prisons (SIP), CONPASS 08. Applicants must be holders of HND certificates obtained from recognized Polytechnics/Colleges in the following areas: Estate Management, Town Planning, Public Health, Food Sciences, Social Works, etc. ii. Inspector of Prisons (IP) Nursing, CONHESS 06.
iii. Assistant Inspector of Prisons (AIP) CONPASS 06. Applicants must be holders of OND/NCE Obtained from recognized institutions. iii. Prison Assistant III (PA.III) CONPASS 03.
i. Applications must be Online. ii. 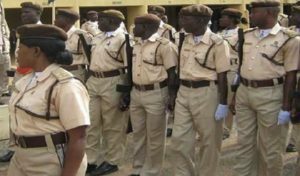 Candidate are expected to log into the website http://recruit.prisonsportal.com.ng/recruit Fill and submit the application form online. Candidates are advised to print out the Referee forms which must be duly completed for submission during screening. iii. Candidates should NOTE that multiple applications will automatically be disqualified. Applications should be submitted online within Six (6) weeks from the date of this publication. i. Applicants must be Nigerians by birth. ii. Applicants must possess the requisite qualification and certificates. Any certificate or qualification not presented and accepted at the recruitment centre shall not be accepted after the recruitment. iii. Applicants must be fit and present certificates of medical fitness from Government recognized Hospitals. iv. Applicants must be of good characters, and must not have been convicted of any criminal offences. v. Applicants must not be members of any Secret Society, Cults or Drug Addicts etc. vi. Applicants must not be financially embarrassed. viii. Applicants heights must not be less than 1.65m for males and 1.60 for females. ix. Applicants chest measurement must not be less than 0.87 for men. x. Computer literacy will be of added advantage. CANDIDATES SHOULD NOTE THAT THIS APPLICATION IS ABSOLUTELY FREE! All applications are expected to be completed and submitted within six (6) weeks from the date of this publication. Ag. Secretary to the Board.